DevOps is high in demand now- days and without writing any overstated details about the technology. Here are Top 15 DevOps Interview Questions and answers and you should prepare for the year 2018. 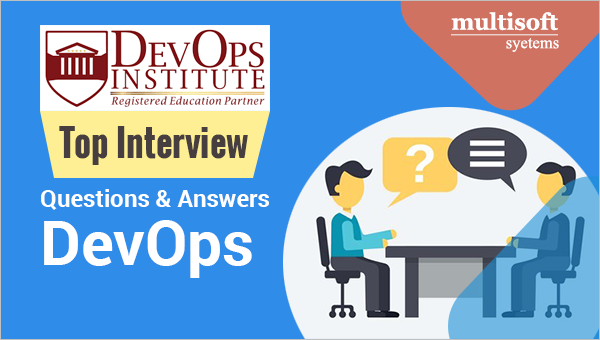 These questions and answers are framed by industry experts from Multisoft systems who train for DevOps Training to give you an idea of questions which may be asked in interview. How is DevOps different from Agile / SDLC? DevOps: DevOps is a set of practices that help in clear communication and seamless collaboration among the development and operations team while presetting the process of software delivery. DevOps is highly practiced for rapid roll out software updates regularly. Agile: Agile is an iterative approach to application lifecycle management. As a substitute of managing all the planning upfront, it focuses on being lean and creating minimum viable products by setting-up time periods. Conclusion: DevOps is a concept that we use to handle end-to-end engineering process while Agile is a process used for the development of complex projects. What are the major Open Source DevOps Tools? DevOps Toolchain is a combination of tools that helps in development, deployment and management of Apps throughout the development lifecycle as organized by the organization that uses DevOps. What is the most important thing DevOps helps us achieve? The most important thing that DevOps helps us achieve is that it brings a change in the production as quickly as possible without compromising quality of the software. Moreover, it reduces the risk related the development of the software. There are several other positive impacts of DevOps. For example clearer communication and better working relationships between teams. Explain with a use case where DevOps can be used in industry/ real-life. Etsy is a commerce website focused on vintage items and supplies, as well as unique factory-manufactured items. Etsy thrashed with slow, painful site updates that normally caused the site to go down. It affected sales for millions of Etsy’s users who sold goods through online market place and risked driving them to the competitor. Explain your understanding and expertise on both the software development side and the technical operations side of an organization you have worked with in the past. DevOps engineers always work in a 24/7 business online environment. I was flexible to on-call duties and was always available to take up real-time, live-system responsibility. I successfully automated processes to assist constant software deployments. I have experience with public/private clouds, tools like Chef or Puppet, scripting and automation with tools like Python and PHP, and a background in Agile. What are the anti-patterns of DevOps? What DevOp tools have you worked with? How DevOps is helpful to developers? It helps in fixing the bug and implement new features quickly. It provides a clear communication among team members. Discuss your experience building bridges between IT Ops, QA and development. DevOps is a concept that is all about seamless communication and collaboration. I’ve been comfortable to work on production issues from the development and operations sides, successfully straddling the two worlds. What was the most difficult architecture project you have handled and is out of confidentiality bounds? What platforms does Docker run on? Specific instructions are available for most Linux distributions, including Ubuntu, RHEL, SuSE, and many others. What’s your career objective in your role as a DevOps engineer? In a way to get on the top, it is important that you define yourself. Coders with DevOps skills are commonly ask to communicate with an operations team, so make your writing skills better through prominently on your resume. My passion is to overcome with all the trouble and improve the process, so that the development and operation teams perform well. It is an opportunity to get involved in the entire system from beginning to the end.